If we know one thing for certain about the England riots, it's that the public have been urging the courts to dish out some serious punishment. The Court of Appeal, which plays a crucial role in intervening in sentencing, has finally had its say - and England's top judges haven't held back in reflecting the public anger. The Lord Chief Justice, Lord Judge, and his senior colleagues Lord Justice Leveson and Sir John Thomas, have delivered a judgement that unambiguously supports most of the long sentences handed down so far. Two of the appellants were the men jailed for four years apiece for encouraging rioting via Facebook. 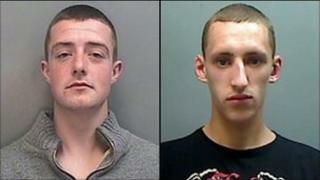 A further five were jailed for burglary and the remaining three had all committed handling offences. All of the 10 had pleaded guilty so could not appeal against conviction. Sentencing is a very technical process and you can read a lot more about it at the Sentencing Council website. But the crucial thing to bear in mind is that a judge's hands aren't tied to existing guidelines when they have to deal with an unprecedented situation. Short of using red ink, capital letters and triple-underlining, the Lord Chief Justice could not have been clearer why those convicted of playing a part in the riots should expect to be treated severely. "Those who deliberately participate in disturbances of this magnitude, causing injury and damage and fear to even the most stout-hearted of citizens, and who individually commit further crimes during the course of the riots are committing aggravated crimes. "They must be punished accordingly, and the sentences should be designed to deter others from similar criminal activity. This is not new-found sentencing policy." And it's that last sentence that is so important. During the appeal hearing, counsel for the appellants tried - largely in vain - to argue that the crimes should be dealt with in isolation. In other words, punish my client for his sin - but not the sins of all. But the Court of Appeal's view was that each person had a choice as the disorder unfolded on rolling news networks. Each night, as the violence spread, people could either stay at home or join a national smash-and-grab. If they chose the latter, they added to the dangers to the public and added to the international shame being heaped upon the UK. More than 40 years ago, the Court of Appeal ruled that involvement in public disorder should lead to longer sentences: burgling a shop on Friday is not the same as breaking in during a riot on Saturday. "It is elementary that sentencing courts cannot ignore the context in which the crime or crimes for which sentence is to be passed was committed. It is an essential feature in the assessment of culpability. "The reality is that the offenders were deriving support and comfort and encouragement from being together with other offenders, and offering comfort support and encouragement to the offenders around them. "Perhaps, too, the sheer numbers involved may have led some of the offenders to believe that they were untouchable and would escape detection." So the fact that you were there - and the fact that you did it - means you should expect the tough sentence. But where does that leave Blackshaw and Sutcliffe-Keenan - jailed for encouraging rioting on Facebook, even though they never took part themselves? The defence argument goes something like this: "M'lud, they didn't really mean it - they were stupid but regret it - and at the end of the day, they encouraged others to commit a crime on a social network, rather than going out and knocking on doors to get their mates onto the streets." "Modern technology has done away with the need for such direct personal communication. It can all be done through Facebook or other social media. "In other words, the abuse of modern technology for criminal purposes extends to and includes incitement of very many people by a single step. "Indeed it is a sinister feature of these cases that modern technology almost certainly assisted rioters in other places to organise the rapid movement and congregation of disorderly groups in new and un-policed areas." So the Court of Appeal upheld the sentences against the Facebook duo and the burglars who took part in the disorder. But what about those convicted of handling stolen goods? In each of the three test cases, the individual had not been directly involved in the disorder. But they had seen an opportunity to profit. David Beswick, one of the three, had a looted TV in the back of his car. He was taking care of it as a favour, in return for £20. "Well, like a dickhead I was just holding it for someone else". Beswick had watched the rioting in Salford, the court said, but had not taken part. His crime was to handle the goods knowing they would have been looted by someone else. The court said they deserved jail for handling - but their sentences were halved to draw a line between them and those who took part directly in the disorder. Almost 2,000 people have now appeared before the courts - but only a quarter of the cases have been sentenced. Every prosecutor around the country will be carrying the Court of Appeal's judgement into court. They'll have a spring in their step - but there will be some very glum faces in the dock.